We have already tested both the 9V Duracell Alkaline batteries and the 9V Duracell Procell Alkaline batteries and we’ve seen interesting results, we’ve decided to do a direct comparison between the two since there is a common belief that the Duracell Copper Top Alkaline batteries are actually the same as the Duracell Procell Alkaline. If the two types of batteries are exactly the same they should be able to provide very similar useable capacity in our tests, however this is not the case as you will see in a moment. In order to make sure that we are properly comparing the two types of batteries we got them with matching expiration dates just to be sure that there should be no significant difference due to self discharge if they were produced in bigger time difference. 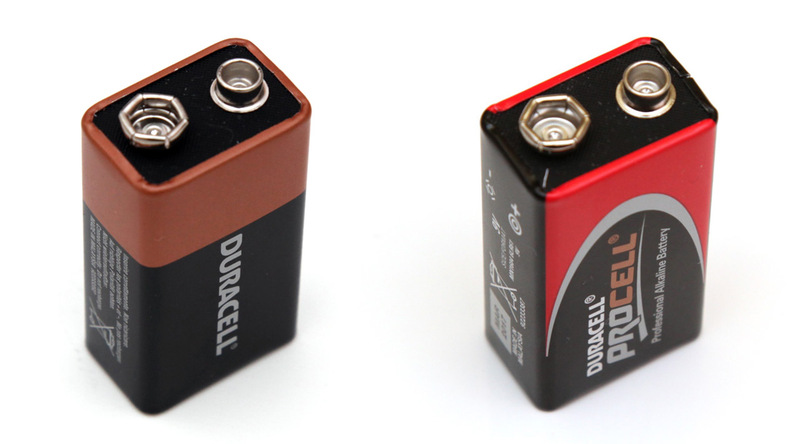 So far our comparisons between Duracell Copper Top and Duracell Procell batteries have shown slight advantage in favor of the Procells for the AA and AAA size, so this time we kind of expected to get similar results, but to our surprise we did not. In fact the standard Copper Top Duracell battery did provide better result and with over 20% higher useable capacity than the Procell this is a significant different. We did check the expiration dates to match and have repeated the test with another 9V Duracell Procell battery just to be sure there was nothing wrong, but we got pretty much the same lower capacity from the Procell. In the end we can say that we were really disappointed from the 9V Duracell Procell batteries, we expected to see more from them, especially considering the fact that around 300 mAh is what a decent 9V Alkaline battery should be able to provide in our test conditions. With these results there is no way to recommend the Procell over the standard Copper Top model when talking about 9V Alkaline batteries from Duracell, though that is not the case with AA and AAA size Duracell batteries where we’ve seen very good performance from both Copper Top and Procell Duracell batteries. In fact when talking about 9V Alkaline batteries we are not going to recommend you to go for a Duracell at all, regardless if Copper Top or Procell as we have already tested other brands that are capable of giving you close to 50% more capacity than what Duracell does… and at a price that can be lower than that of Duracell!